After a busy week in the office the team at GG like nothing better than to start the weekend in style with a delicious Buffalo Trace cocktail and today after a rather gloomy week in London we thought we’d take some bourbon flavoured cheer to our friends at My Daily, AOL and Huffington Post. Along with a fabulous team from Hi-Spirits we set up a pop up bar in the Huffington Post offices and introduced the teams to some tasty Friday afternoon refreshments. 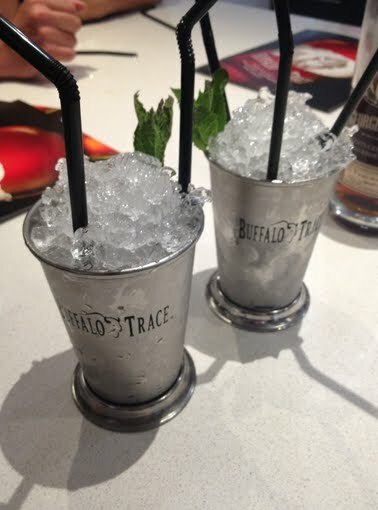 The firm favourite was the fresh tasting mint julep which is made from Buffalo Trace, Mint Leaves and simple syrup. DO try this at home! The team also got to learn about Buffalo Trace’s heritage. Did you know that the name Buffalo Trace actually derives from the founders of the award winning distillery literally following a gang of Buffalos to a river crossing? #FridayFact!